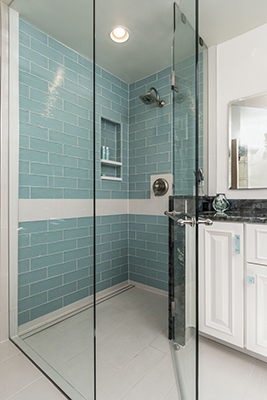 When considering a bathroom remodel, it can be the seemingly little things that make all the difference and linear drains are one of those little big things. You may be asking, “what is a linear drain?” A linear drain is a long, narrow rectangular drain that maximizes the water flow towards a single exit allowing for improved drainage with a minimalistic design. They are a stylish architectural focal point and really enhance the aesthetic of a space. We are using them more frequently in our own designs. Installation – Linear drains require that the shower floor be sloped in only one direction rather than in four towards a center drain, which means that rather than standing in water while the water drains, it all flows away from you toward the drain. Curb-less– With a linear drain and the right shower design, you no longer need a traditional step or curb into the shower, making it “barrier free.” With over 2 million people annually injured in home related accidents related to falling, a curb-less shower improves safety and the quality of life and removes the fear factor in showering. Linear drains allow for wheel chair access and are ADA (American Disability Act) compliant. 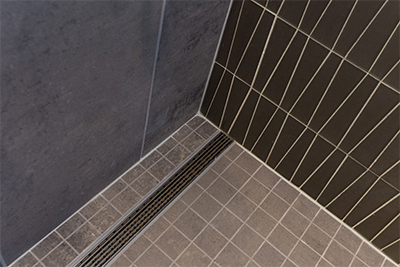 Design and Continuity – Linear drains allow us the option of continuing the same tile used for the bathroom floor into the shower. The Tile-In option of the linear drain also allows you to “cover” the drain with tile allowing for an uninterrupted look to the shower floor. As we mentioned, linear drains use a single slope which allows the use of larger format tile. Versatility in Placement – Linear drains can be placed in various locations in the shower making them more versatile than a standard center drain. We look at placement of the drain in our design from a functional as well as aesthetic look and typically gently slope the floor and place the drain along the back or a side wall. Maintenance – Linear drains are easy to clean simply using soap and water. Many linear drains have a removable debris basket for ease in preventing clogged pipes from hair. Cost – Linear drains cost significantly more than the traditional center drain, therefore it’s important to determine if what you are gaining is worth the cost. Linear drains are growing in use in residential settings and we are designing spaces utilizing them more frequently. While the cost of the drain and installation is higher than traditional small drains, their aesthetic as well as function often makes it worth the investment. Just like all aspects of the design, it comes down to our homeowners determining what gives them the best bang for their buck. In our opinion, you really can’t go wrong with a linear drain. See for yourself with couple showers we’ve created.